I'm Running to Eat! : Good News! The next part was pretty good too. The doctor's office just happens to be down the street from a Macaroni Grill so dh and I went out for lunch to celebrate. I had the Mozzarella alla Caprese and it was amazing. Juicy tomatoes, creamy buffalo mozzerella, fresh basil and some delicious balsamic vinegar. Mmmm! Dh raved about his meatball sub and I'm scratching my head, trying to re-create the yummy bowl of Chicken Toscana soup I had. 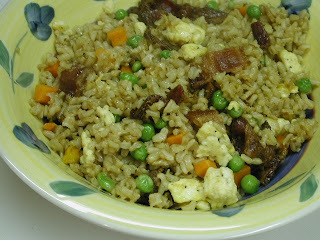 My older daughter may be a picky eater but I do know one sure way to please her -- Fried Rice. She loves it because it tastes good. I love it because it's fast and easy and it's a good way to sneak a few veggies into her diet. Today we were running late after all the appointments, practices and track meets and so I grabbed a bit of brown rice out of the fridge (I always try to keep some pre-ccoked rice in the refrigerator for quick meals or snacks. ), some leftover scrambled eggs and bacon from our weekend "breakfast feast", some frozen carrots and peas, sauteed it all in a little olive oil and then tossed in a bit of Oyster Sauce and a dash of soy sauce. Perfect! My intent was to whip up a bowl of rice that she could eat as quicly as possible so she could get to bed and then I'd fix a more leisurely dinner for dh and myself. It tasted so yummy I ended up mixing up a new batch for the grown-ups! We generally have veggie rice since I'm the one cooking, but the bacon gave it such a delicious smoky flavor that we will definitely be having this dish again soon! Heat oil in a wok or large skillet . Add rice and stir. Add Oyster Sauce and soy sauce and stir. Add bacon and vegetables and continue stirring. When heated through add eggs and continue stirring until the eggs are warm. Serve with additional soy sauce as desired.